So the place I was at which allowed me to take the beautiful photos of Chicago in the post below, contained a movie theater. While looking for the manager to get into a locked room, the client and I walked by this promotional display for an upcoming movie. There are a lot of people in my World of Warcraft guild who played with Legos or have kids or siblings who played with Legos. Actually, a long time ago, having kids was the reason you bought Legos. It's only within the last 20 years that Lego realized it has a huge market in adults. 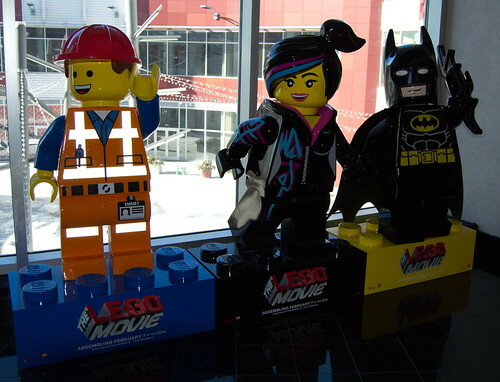 I knew, thanks to guild chat, there was a Lego movie coming out this year. After I finished inspecting the office and was heading back outside, I asked the client to indulge me. I think, if I'd have asked him to take my photo with the Lego people, he would have and I should have, but this was fun as it was. I know a bunch of guild members will get tickets to opening night. I'll wait for their reviews. I'm actually kind of interested to see how they pull this off. The movie preview is quite entertaining. I think Morgan Freeman is typecast again. I Collect Spores, Molds and Funguses.